We have written about “Les plus beau villages de France” before on our blog – it’s the organisation that represents the prettiest villages in France. 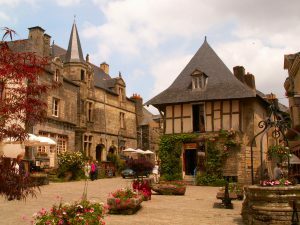 It’s such an amazing resource that we also have a permanent ‘Beautiful French Villages‘ web page explaining the organisation. We’re pretty sure all the information you need about this wonderful collection of beautiful French villages is available online. 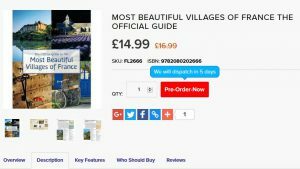 However, if you prefer to flick through a physical book rather than sit in front of a screen, you can buy The Official Guide to the Most Beautiful Villages of France from Vicarious Books. Vicarious Books has lots of other really useful and inspirational books and guides for motorhome travellers too. You can find them all on their website covering a huge range of topics, from The Great War Battlefields to How to Build Your Own Campervan (we won’t be encouraging that activity!). Vicarious Books are based in the UK and will dispatch books to anywhere in the EU. If you are based outside the EU, just use our address for the delivery. We will hold your books for you and hand them over when you get here to collect your motorhome. ← Guédelon, our favourite local attraction, is about to reopen for the season!